We here in Arizona are not alone, while we have 3.5 Million homeowners in this state alone we are joined by 70 Million other homeowners from across the country. There is no issue that happens here that has not happened somewhere else in this country or Canada. We have provided links to reference documents or other web sites of advocates, or videos from news reports from around the country. The opinions expressed in these links are those of their respective owners or authors and not necessarily the opinions of Arizona Homeowners Coalition. If you need help maneuvering thru these links or would like some specific guidance on what sites would best fit your situation please contact us at help@azhoc.org. 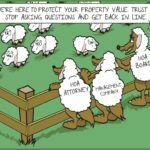 The Arizona Homeowners Coalition and the AZHOA Homeowner Advocate are not attorneys and do not provide legal advice of any kind. While we may advise you based on our knowledge of the law and experience, you may not use that advice as legal advice in any matter. Please consult an attorney if you are contemplating any legal action. The Privatopia Papers http://privatopia.blogspot.com ; Evan McKenzie on the rise of private urban governance and the law of homeowner and condominium associations. Arizona HOA Blog http://arizonahoa.blogspot.com ; A forum for Arizona Homeowners anxious to see changes in the Homeowner industry. Coalition for Community Housing Policy in the Public Interest http://www.chppi.org/ ; Chppi seeks to educate housing consumers about their rights and responsibilities, should they choose to live in an Association-Governed Residential Community. Chppi firmly believes that every consumer deserves transparent, full disclosure of community governance standards, ongoing documentation of fiscal health, and the right to reside in a safe, healthy, and welcoming community. South Carolina petitions legislation for HOA bill to protect homeowners and their wallets. Project Veritas http://projectveritas.com; Project Veritas is a registered 501(c)3 organization. Project Veritas does not advocate specific resolutions to the issues that are raised through its investigations, nor do we encourage others to do so. The goal of Project Veritas is to inform the public of wrongdoing and allow the public to make judgments on the issues.